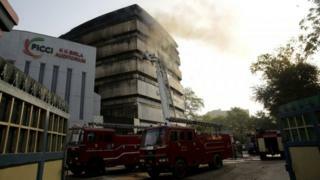 A fire has destroyed a museum in the Indian capital, Delhi, ruining rare specimens of flora and fauna, India's environment minister has said. "This is a real loss. This loss cannot be counted in rupees. Some very old species of flora and fauna were there," Mr Javadekar was quoted by the AFP news agency as saying. A fire officer told the NDTV news channel that the building's "fire safety mechanisms were not working". "That is why it took us so long to douse the fire. The cooling off process is still on," he said. The museum housed galleries with "herpetological specimens, preserved butterflies, and mounted specimens" of animals, according to its website. The museum had been criticised for "being badly designed and poorly maintained", and there were plans to move it to a new building at another location.